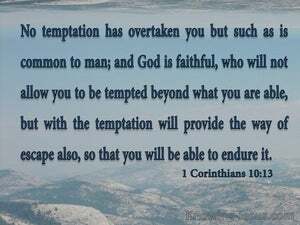 ﻿ 1 Corinthians 10:13 No temptation has overtaken you but such as is common to man; and God is faithful, who will not allow you to be tempted beyond what you are able, but with the temptation will provide the way of escape also, so that you will be able to endure it. No temptation has taken you except is common to man. 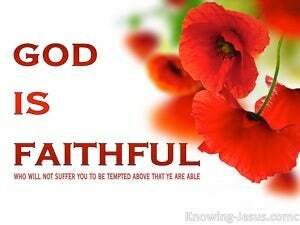 But God is faithful who will not allow you to be tempted above what ye are able, but with the temptation will also make the way to escape, to enable you to endure. Every temptation that you have experienced is one that commonly happens to people. But God is dependable and will not allow you to be tempted beyond your ability [to cope with it]; [instead] He will provide, along with the temptation, also a way of escaping [it], so you people will be able to endure it. No trial has come upon you but such as is common to man: but God is faithful, who will not suffer you to be tried more than you are able to bear; but he will, with the trial, make a way to escape, so that you be able to bear up under it. No temptation has overtaken you but such as is common to man. 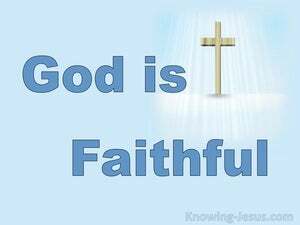 And God is faithful, who will not let you be tempted beyond what you are able, but with the temptation will provide the way of escape also, so that you will be able to endure it. you have met with no trials yet, but such as are common to men: and God who is faithful, will not suffer you to be tempted above your strength; but will with the temptation make a way to escape, by enabling you to bear it. No temptation has taken you but such as is according to man's nature; and God is faithful, who will not suffer you to be tempted above what ye are able to bear, but will with the temptation make the issue also, so that ye should be able to bear it. No temptation has overtaken you, except that which is human: but God is faithful, who will not suffer you to be tempted above what you are able, but with the temptation, He will also make a way of escape, in order that you may be able to bear it. It is no superhuman temptation that you have had. And God can be depended on, not to let you be tried beyond your strength, but when temptation comes, to give you a way out of it, so that you can withstand it. There hath no temptation taken you, but such as is common to man; and God is faithful, who will not suffer you to be tempted above your ability, but will with the temptation make also a way to escape, that ye may be able to bear it. No temptation except human has taken you and God faithful, who will not suffer you to be tempted above what ye are able; but with the temptation will he also make an escape, that ye may be able to bear. Temptation has not come upon you except [what is] common to humanity. But God [is] faithful, who will not permit you to be tempted beyond what you are able, but will also make a way out together with the temptation, [so that you] may be able to endure [it]. No temptation has taken you but what is common to man; but God is faithful, who will not allow you to be tempted above what you are able, but with the temptation also will make a way to escape, so that you may be able to bear it. There hath none other temptation taken you, such as followeth the nature of man. God is faithful, which shall not suffer you to be tempted above your strength: but shall in the midst of the temptation make a way to escape out. No temptation has waylaid you that is beyond man's power; trust God, he will never let you be tempted beyond what you can stand, but when temptation comes, he will provide the way out of it, so that you can bear up under it. No temptation has overtaken you that is beyond man's power; but God is faithful, who will not let you be tempted beyond what you can bear, but will, with every temptation, provide the way of escape also, so that you may be able to withstand. No temptation hath come upon you, but such as is common to man; but God is faithful, who will not suffer you to be tempted beyond what ye are able to endure, but will with the temptation furnish also the way to escape, that ye may be able to endure it. For no trial has befallen you but what is common to man; and God is faithful, who will not permit you to be tried beyond what you are able, but with the trial will order the event, that you may be able to endure. Trial, hath not taken you, save such as man can bear; faithful, moreover is God, who will not suffer you to be tried above what ye are able, but will make, with the trial, also the way of escape, that ye may be able to hold out. No temptation hath overtaken you, but what is common to men. And God is faithful, who will not suffer you to be tempted beyond what ye are able to bear; but will with the temptation make also a way to escape, that ye may be able to bear up under it. No temptation has come upon you that is not common to all mankind. God will not fail you, and he will not allow you to be tempted beyond your strength; but, when he sends the temptation, he will also provide the way of escape, so that you may have strength to endure. There hath no temptation taken you but such as is common to man: but God is faithful, who will not suffer you to be tempted above what ye are able; but will with the temptation also make a way to escape, that ye may be able to bear it. 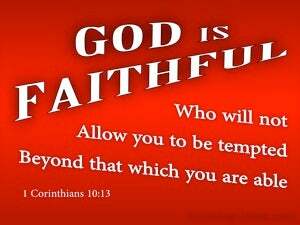 No temptation has you in its power but such as is common to human nature; and God is faithful and will not allow you to be tempted beyond your strength. But, when the temptation comes, He will also provide the way of escape; so that you may be able to bear it. No temptation has taken hold of you but what is common to human nature. And God is to be trusted not to let you be tempted beyond your strength, but when temptation comes, to make a way out of it, so that you can bear up under it. A temptation has not taken you, except such as is common to man; but God is faithful, Who will not suffer you to be tempted above what ye are able, but will with the temptation make also the way of escape, that ye may be able to bear it. No temptation has yet taken you but what is common to man: and God is faithful, who will not suffer you to be tempted above what ye are able to sustain; but will with the temptation also make a way of escape, that ye may be able to bear it. No temptation hath taken you -- except human; and God is faithful, who will not suffer you to be tempted above what ye are able, but He will make, with the temptation, also the outlet, for your being able to bear it. 12 Therefore let him who thinks he stands take heed that he does not fall. 13 No temptation has overtaken you but such as is common to man; and God is faithful, who will not allow you to be tempted beyond what you are able, but with the temptation will provide the way of escape also, so that you will be able to endure it. 14 Therefore, my beloved, flee from idolatry. 'For I know the plans that I have for you,' declares the LORD, 'plans for welfare and not for calamity to give you a future and a hope. now behold, this town is near enough to flee to, and it is small. Please, let me escape there (is it not small?) that my life may be saved." 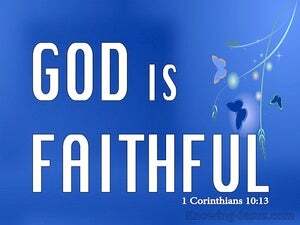 "But I will not break off My lovingkindness from him, Nor deal falsely in My faithfulness. and said to them, "Why are you sleeping? Get up and pray that you may not enter into temptation." and the rest should follow, some on planks, and others on various things from the ship. And so it happened that they all were brought safely to land. 'Because you have kept the word of My perseverance, I also will keep you from the hour of testing, that hour which is about to come upon the whole world, to test those who dwell on the earth.